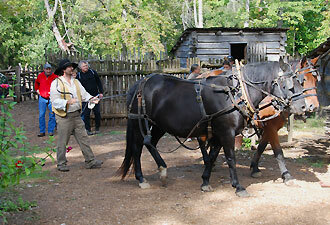 Park ranger in period clothing demonstrates farm life with historic implements and agricultural techniques. Are you as surprised as I was to hear that the postal service had anything to do with the arrival of baby chickens? Eager to see the new additions to the farm family, I picked up my camera, arrived at the barn, and was greeted by Jack and Link the horses and Cinnamon the cow. The farm’s three sheep also came around to see what was happening. Charlotte's Web came to mind as I watched all the animals gather to say hello. The chicks were settling nicely into their new home, chirping their own greetings to new friends. It is a pleasant, 45-minute drive from Evansville, Indiana, through the rolling hills and farmland of the southern part of the state, to Lincoln Boyhood National Memorial. Once you arrive, visit the farm animals, stroll through the cabin, and talk with park rangers who are nurturing the same fields that the Lincoln family did when they lived here. “There I grew up,” Abraham Lincoln wrote in reference to his southern Indiana home. At the national memorial, you have the opportunity to walk the same ground he trod while growing into a man. 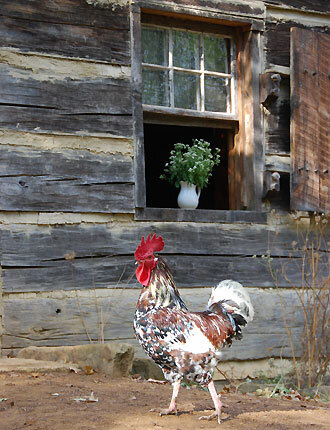 The Living Historical Farm is a working pioneer homestead with a log cabin, outbuildings, split rail fences, livestock, gardens, and field crops. 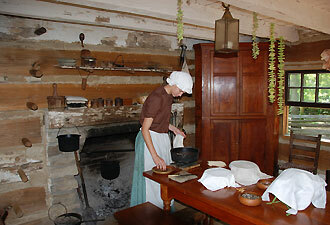 Rangers dressed in period clothing perform a variety of activities typical of daily life in the 1820s. The Memorial Visitor Center, with its museum and movie, provides background information on Lincoln's formative years. Among the more outstanding features of the national memorial are the five sculptured panels on the exterior of the visitor center. These works of art illustrate the steps in Lincoln's life that brought him from a cabin to the White House. Springtime brings new life to the farm and the forest. The land that nurtured a young boy who would become a national hero continues to nurture today. The lambs and a calf will soon be joining our growing chickens and roosters, and the other animals, in their walk around the farm this year. Bring your camera and join them.